Realizing that you want to build your own home is an exciting time! There's so much to consider, so many plans to make, and a long list of NH home builders to consider for the project. But where do you begin on your search for a New Hampshire home builder? Of course, there will be bumps in the road during home builder construction. But knowing you have a residential builder who understands how to manage a new construction project of custom built homes, you can be assured that you have the best home builder in southern New Hampshire by your side. 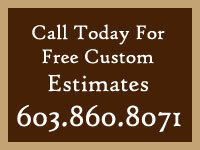 And as your NH home builders of choice-we'll take care of the rest and start construction as soon as possible! As long as it takes, no matter what obstacles we face during the construction phase, Trinity will ensure that the project keeps moving forward-as we've built a reputation of excellence of being a residential home builder that cares about its customers. While building a new home can seem like an extremely stressful project, we believe that as long as the lines of communication remain open and strong between homeowner and Trinity as your residential home builder, then that alleviates concerns and questions. Don't miss out on what could be the best opportunity to work with NH home builders who will strive for excellence-whether your home is rustic, contemporary, classic or modern. Rely on Trinity as the NH home builders who will ensure a success project delivers you the home of your dreams!